John LeCarre said in one of his books, “A desk is a dangerous place from which to view the world.” And most of us would certainly agree with that assessment. So many leaders today seem to want to be somewhat inaccessible and unapproachable, as if that confirms their power or eliminates problems of something. Could any belief be farther from the truth? MY suggestion is that leaders need to lead, to be hands on with their people to discuss issues and opportunities. I support supervisors with the Stupidly Simple Square Wheels Facilitation Toolkit along with The Square Wheels Project, a simple online training course currently priced at $10 for 30 minutes of LMS time and with downloadable tools. My Lost Dutchman game is rated one of the very best in the world, and is also one of the cheapest. And it is designed so a manager can lead their teams in a journey to mine as much gold as we can. What else is new in the workplace? We should always be looking for ideas and behaviors to mine more gold. The reality is that the rope is generally too long and the wagon puller generally too lonely. 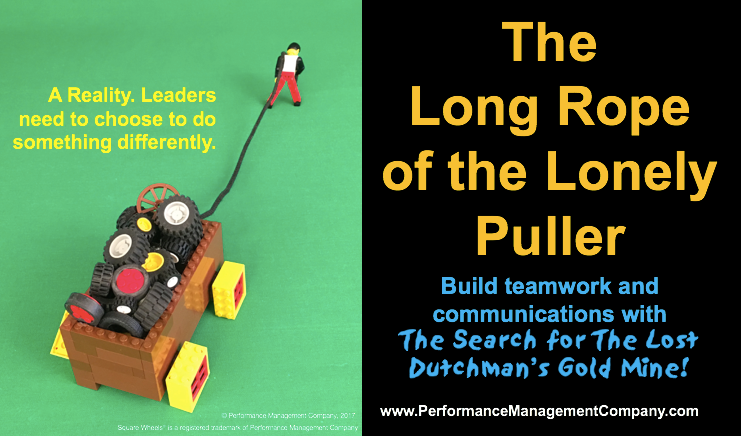 Yes this post is a bit different than most of my others, but I wanted to reinforce the idea that to generate innovation and motivation, we need to generate active involvement, teamwork, shared goals and push people to do a better job of collaborating and working together.